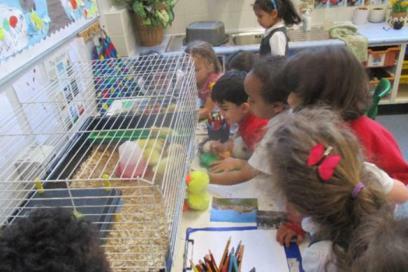 Gateway Academy Westminster - Nursery - eggs, ducklings, planting seeds and more!! Nursery - eggs, ducklings, planting seeds and more!! This week, Mr Dave visited the Nursery to help them crack open the ostrich egg. The children tried standing and sitting on the egg but it did not break. So, Mr Dave brought a hammer and a chisel with him and eventually managed to crack it open. The children cooked the egg and told me it was delicious! They also had a taste of quails, hens, turkey, goose, guinea fowl and duck eggs. The Nursery children have also been very busy looking after the ducklings that hatched last week. Yesterday the ducklings had their first swim! On Friday they will go back to the farm. Mrs Boohan has asked me to say thank you to all the adults who came in to plant a sunflower seed with their child this week. The flowers should be blooming by the time the school reopens after the summer holidays.